The Conservative Health Care Plan saves taxpayers over $100 million, does not shove people off private insurance, allows patients to keep their current doctor, and most importantly does not expand Medicaid. 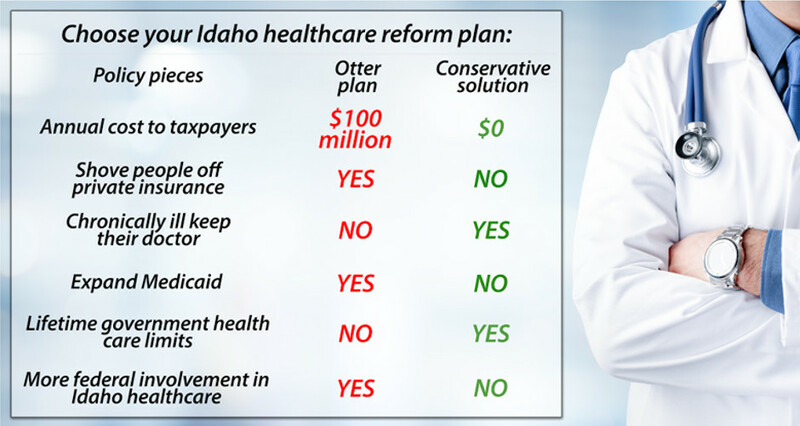 We need Idaho solutions which allow people to exercise individual choice in healthcare rather than the big-government plan to put more Idahoans on a federal program. Idahoans deserve choices, low costs, and independence in their healthcare, not more federal dependency and control. The Conservative Healthcare Plan is a freedom alternative for Idahoans.